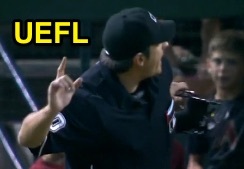 HP Umpire Mark Ripperger ejected Diamondbacks Manager Chip Hale for arguing a strike three call in the bottom of the 6th inning of the Mets-Diamondbacks game. With two out and none on, Diamondbacks batter Paul Goldschmidt took a 3-2 fastball from Mets pitcher Bartolo Colon for a called third strike. Replays indicate the pitch was located off the inner edge of home plate and thigh-high (px 1.083, pz 2.476), the call was incorrect. At the time of the ejection, the Mets were leading, 1-0. The Diamondbacks ultimately won the contest, 2-1. This is Mark Ripperger (90)'s first ejection of 2015. Mark Ripperger now has 0 points in the UEFL Standings (2 Previous + 2 MLB - 4 Incorrect = 0). Crew Chief Jeff Kellogg now has 7 points in Crew Division (7 Previous + 0 Incorrect Call = 7). This is the 75th ejection of the 2015 MLB Regular Season. This is the 34th Manager ejection of 2015. This is the D-Backs' 1st ejection of 2015, T-4th in the NL West (SD 7; LAD 5; COL 3; ARI, SF 1). This is Chip Hale's first ejection since March 23, 2015 (Tom Woodring; QOC = U [Throwing At]). This is Mark Ripperger's first ejection since August 27, 2014 (Ron Roenicke; QOC = Y [Balls/Strikes]).